Sometimes one sees the weirdest things in most ordinary places. As advertising comes and goes traveling over the bridge into Wexford it’s probably one of the best seats in the house. Stopped at the lights we are a captive audience. A number of attempts have been made to utilise the area for advertising. From the banner strung from lamp post to lamp post across the end of the bridge. The result being two lamp posts at very odd angles and brief loss of festive lights, courtesy of a winter storm. To an early incarnation of the current frame wildly waggling back and forth in high winds. Wild winds and Wexford go hand in hand. Seriously now who’d imagine the entry to Wexford without it. 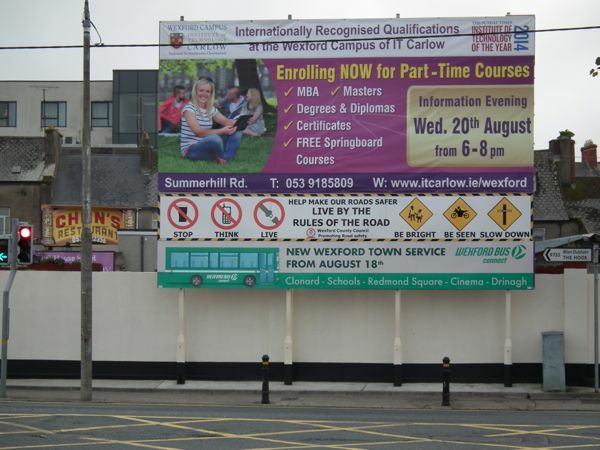 One large bill board with two banners below. I rubbernecked, three times in surprise, luckily at low speed no doughnuts occurred. 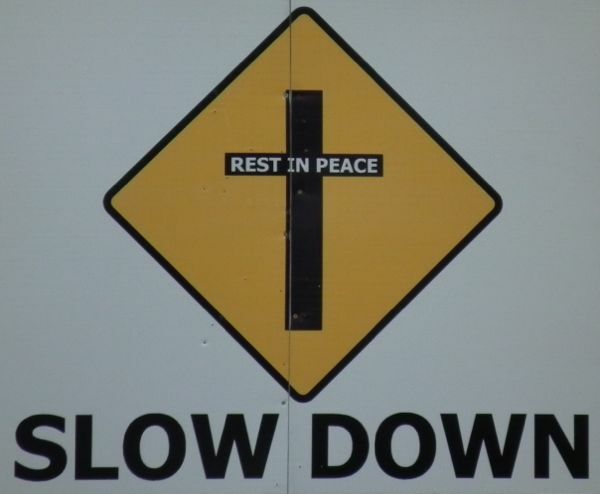 Perhaps it was the pending arrival of Halloween, a graphic designers tendency to note symbols that I was struck by text addition to the slow down sign.